GENI.com has added DNA to its world collaborative tree not just by displaying haplogroups on profiles but also by using DNA to confirm relationships and to match you to other DNA kits. As always, GENI makes it look pretty. There is a DNA marker line in the top profile section that includes badges showing haplogroups and whether autosomal tests are available. Directly under the relationship path at the top it will also note when a relationship is validated by DNA! Look at the top of my Dad’s new profile below. Notice the Y haplogroup R-P312 and the AT badges in the DNA marker line and the part under the relationship where he really is my Dad. To get this I connected the GENI profiles for my Dad, my brother, and myself to our family tree DNA results. Since Family Tree DNA is partnering with GENI the data was available instantly via a login to the other site. One important trick is to log out of Family Tree DNA between doing each profile, else it claims you are still connected. I uploaded a few other DNA tests done at 23andme and Ancestry for relatives who gave permission, but I am still waiting on those to finish processing [update it may be a month or more]. By the way, in order to upload test results for the living, I had to log into their profiles. Dead relatives that I manage or were in my family group were not a problem. I also uploaded my own 23andme results to make sure that I could have two tests on GENI. 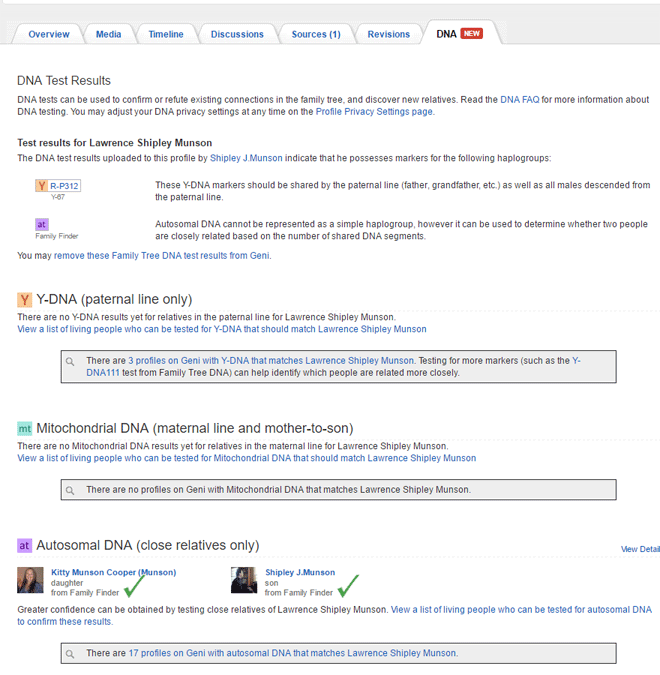 You may wonder what you see if you click on the view details link, well it takes you to all the test and matches information you get in the new DNA tab as shown below. This DNA tab has information about your matches for each test you have done. 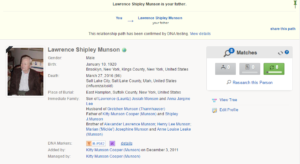 Notice that I used my brother’s profile rather than my own to connect my late Dad to his DNA in order to be sure there were no issues for free members using this feature. DNA on GENI has been available for three days and Dad already has 17 matches. Well two of them are close family and another is known 5th cousin Frode in Norway. Of course my Ashkenazi profiles have over a hundred matches already. So if you click on the blue words with number of autosomal DNA matches you have in the gray box at the bottom of the DNA tab part of the page you will go to a list of matches as shown below. The match list orders each person from closest in DNA to least close. Next to that person’s name and image, it will show you the relationship GENI has actually found (if you have clicked on that person’s profile) as well as the relationship indicated by the DNA. As you can see in many cases the blood relationship is not yet known. If there is a view DNA info in blue next to the profile information you can click to see that person’s match list. The degree of privacy is something that is set in the profile privacy area. It is early stages yet, so of course there are a few things that need correcting or improving. Here is my list. Feel free to add yours in the comments section. A way to limit the DNA matches. For example, I do not want to see Y tests of less than 37 markers nor autosomal matches on my Ashkenazi profiles with largest segments of less than 10. This is a very different approach than the way WIKItree includes DNA tests which includes such niceties as an X path display including expected inheritance percentages. However there is no actual DNA matching at WIKItree and the proven by DNA is something you add yourself. UPDATED … The DNA uploads from 23andme and ancestry may not be available for another month or two at GENI, so perhaps upload your results to family tree DNA if they qualify. See http://blog.kittycooper.com/2014/10/free-transfer-of-dna-data-from-ancestry-to-family-tree-dna/ for the details on how. Results from 23andme before December 2013 or Ancestry before June 2016 can be added to Family Tree DNA. When I vioew my dad’s profile I see: You and Joseph Henry Heffler are related closely enough to verify your relationship using Autosomal DNA. Geni currently has Autosomal DNA data for you but not Joseph Henry Heffler. Since Joseph Henry Heffler is deceased, his autosomal DNA cannot be obtained for testing. This relationship cannot be confirmed with autosomal DNA. I have his results from 23andMe and transferred to FTDNA but it implies that since he is deceased I cannot upload them. I had no difficulty connecting my deceased dad and aunt. 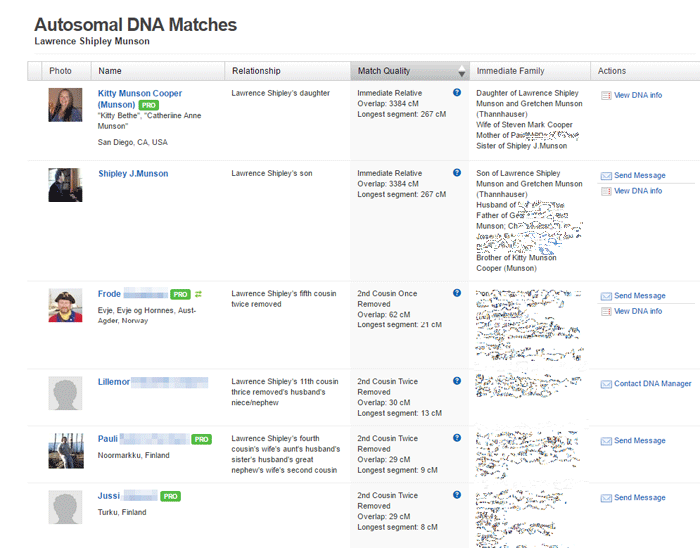 The trick is to be sure you are logged out of ftDNA and are on the GENI profile of the person you want to add DNA to. The one issue I have is that ……….while it shows the haplogroup of mtDna from Ftdna , the program will not show the haplogroup of MtDna from 23andme or others. 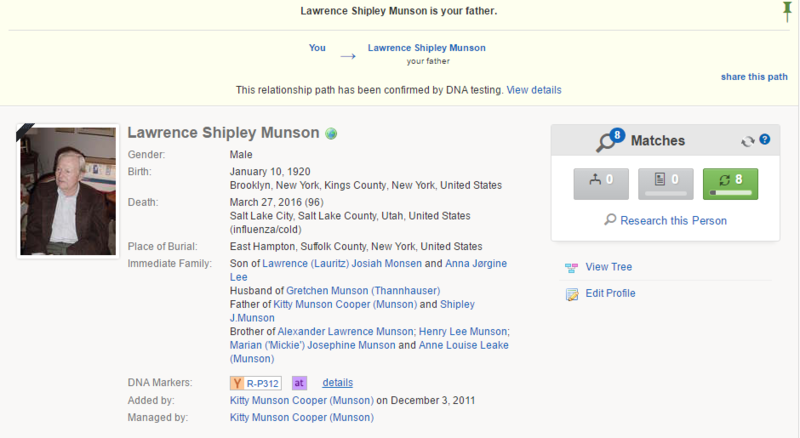 So, by not showing, it does not recognise my fathers line with his mother. The software is not in place yet for the other testing companies and I do not know if the haplogroups will be used from them. Hopefully so. > Your autosomal DNA test results were uploaded to Geni on July 1, 2016 and will be processed soon. How long did it take for your atDNA to be processed? > The DNA uploads from 23andme and ancestry may not be available for another month so perhaps upload those results to family tree DNA if you can. Kuba – I love it when people answer their own questions! If you tested at 23andme long enough ago, you can upload those results to family tree DNA, see my updated addition to this article above. If you have some of your tree on Geni already, AND had your mt or yDNA results uploaded to mito and Y-Search respectively, be aware that those results will already be there, along with any tree loaded to the __search sites. Which will have created duplicates and some hoops to be jumped thru to connect up the Geni living profiles with their owners, not to mention merging existing profiles. I’ve spent the last day trying to tidy just two such kits, mine and a cousin’s. I think I’ll give up trying to sort out any for the projects I administer! Too many trees, too much time correcting rather than researching. I like the idea of Geni’s dna links but until the results can be filtered to show just the meaningful ones instead of a heap that don’t even show as matches at FTDNA as they are so small (atDNA) or are only 12 yDNA markers, this is too time consuming. I’ll stick to WikiTree for now until I gain more patience for tidying/linking. The program seems to not given people of Genetic distance of 2 or more. I prefer if we could control this feature as I would only show people with zero genetic distance.